Meditation is the most important activity you can do – simply that. Meditation is not just an Eastern esoteric practice. In one form or another and under different names it has been around for centuries in both East and West. It has been practised by monks, mystics and intellectuals alike — from St. Thomas Aquinas to Nikola Tesla and Sherlock Holmes who liked to sit down in his armchair and ‘throw his brain out of action’ before solving any difficult case. Did you know that the physical postures most people think of when saying ‘yoga’ today were initially just an introduction into meditation? According to Yoga Sutras of Patanjali, the oldest codified text on yoga from around 400 CE, yoga asanas were intended only for making the body strong and steady enough to be able to spend longer time meditating. The breathing practices were similarly used to enhance health and reach deeper levels of focus. Yoga was seen as ‘stilling of the restless mind’. All yogic practices involving moral, physical and mental discipline were used to purify the mind so it would become like clear water reflecting universal wisdom. The motives for meditating in the contemporary society are a bit different than in the times of Patanjali. Instead of searching for wisdom we are more after the possible therapeutic benefits of meditation. Some of the neurological studies indicate that meditating on regular basis, even just 20–30 minutes a day can bring structural changes in the grey matter of the brain. The areas that showed the most neuroplasticity were those in charge for learning, emotion regulation and the perception of self. But what is actually meditation? The word itself can mean different things for different people — a number of techniques practiced in a number of ways, sitting still, lying down, walking, focusing on the breath, mantra, a sound, an external object or an area of the body, keeping the eyes closed or open. But what is it that all these different practices have in common? It’s being truly present, but not ‘eaten up’ by the experience. Just watching. We are so much used to reacting to whatever happens around us. But what if we just stop for a moment and listen instead? And that’s exactly what meditation is — changing perspective. Instead of swimming in our thoughts we take the feet out of the water for a moment and just watch as the river flows by. Meditation is not the same as daydreaming. Yes, in both cases we do sort of ‘sit and do nothing’. But while in daydreaming we let thoughts carry us away, in meditation we remain present and watch the thoughts as they come and go. We are not participating in the story but sitting in the audience and watching the show. Meditating you let everything be as it is, simply witnessing things without the need to change them. Allowing yourself to just BE for a moment without the need to DO anything. And this in itself is incredibly liberating and empowering. It makes us reawaken to the simplicity of being alive — noticing the sensations of the feet on the floor, the breath moving through the body. Being alive and awake to the experience. Really being there — right here, right now, however that feels. And this is the very place where you can always find rest, no matter how difficult, fast and complicated the life gets — the simple experience of your very aliveness. This is the place from where you can look at your life at a wider, more comprehensive angle and make the right decisions. As you read this text, notice the position of your body. Are you leaning into the screen? Become aware of your body for a moment. Feel the chair under you, the warmth of your feet in the shoes, the shirt moving slightly as you breathe. Ask yourself: “How do I feel right now?” and notice how the rational mind starts coming up with answers. Notice how thoughts bubble up and dissolve one by one, if you don’t run after them. Notice any feeling that comes up in the body as you ask the question, any picture, words or a particular mood. Take a couple of seconds to feel how is that you really feel at this very moment, without trying to explain it. OK, that was all. You can do this mini meditation any time when you have a couple of spare minutes, even seconds, but especially when you feel upset, anxious, or maybe just before writing an angry email to someone. Taking a quick snapshot of your mind at that very moment can help you stand back in your centre and be able to make decisions with more clarity. 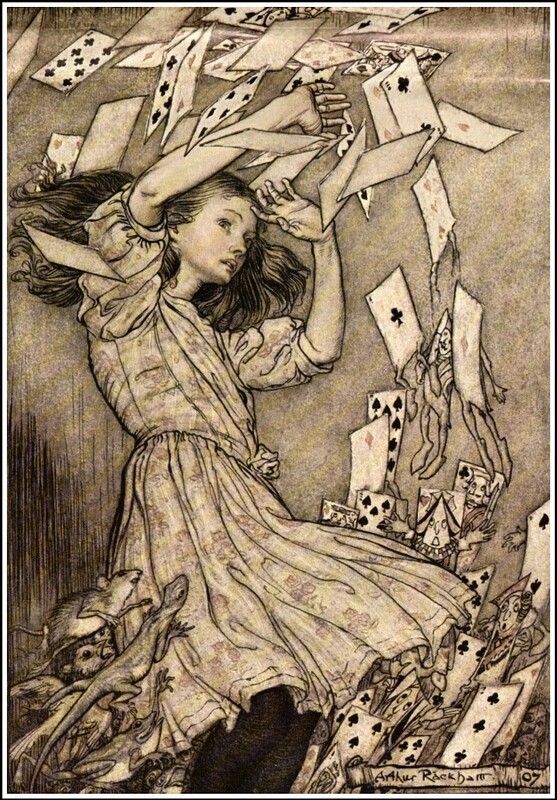 Changing the view point, stepping back and looking at your worries from afar you suddenly feel like Alice in Wonderland who has realised that the great Queen of Hearts and her army are nothing else but a stack of harmless playing cards.